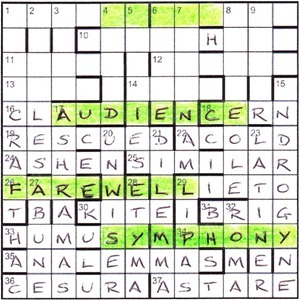 Another puzzle from one of the crossword world’s most prolific setters, although I can’t believe it’s over three years since his last Listener outing. Back in 2011, we had a trip to Mervyn Peake’s Gormenghast Castle. This week… well who knows what lay ahead, but five misprint corrections needed identifying, followed by strings of letters to be removed from a few clues and then from the grid. I think Phi is at the difficult end of the Listener spectrum. Occasionally, he is at the bloody difficult end, given the time it took me to complete no. 4061, 50-50, back in 2009. 1dn Ward of court unexpectedly showing hunting skills (9) looked like an anagram, and the ‘skills’ part of the clue gave me CRAFT and the WOOD soon followed. That meant that ‘ur’ were superfluous letters. 2 ALLELES, 3 URDE and 4 Quiet conclusion to chime in poem (5) SHEND came in quick succession, and a check with Chambers showed that the last meant ‘chide’, not ‘chime’ so my first misprint was identified. I managed to get a few more down clues, so was feeling a bit more upbeat about the puzzle. When I finally got 14ac US prison, not the first to incorporate new cell call (4) ([B]RIG containing N) and 6dn Best Nest one amongst old atomic researchers (5) (I in AERE), I had A D N as three of my corrected misprints. It looked as though we were in HAYDN territory again, 205 years after his death. At this point, I wasn’t deliberately looking for anything hidden in the grid, but getting 33 HUMUSY, with PHONY already to its right, made SYMPHONY jump off the page. I then saw FAREWELL and AUDIENCE a few rows further up, but delayed any googling until I had a finished grid and removed the strings of letters from the stage, represented by the first four rows. With that, I had just one false start: in 32dn Traveller’s order upset mother (4) ROMA, I had ‘der’ as the extra letter sequence rather than ‘rde’. Another attempt, and Haydn, represented by H, was left sitting in his seat. Even STAGE in the top row disappeared, although not its highlighting. When I did get around to Google, I discovered why it was called the Farewell Symphony (No. 45 in F-sharp minor). It was Haydn’s hint to get Hungarian Prince Nikolaus Esterházy to finally pack up his overlong stay at the summer palace: the composer had the musicians playing the piece gradually disappear off stage as their contribution concluded. Thanks to Phi for a not-too-difficult puzzle, and for the cunning way he implemented this musical theme. This entry was posted on 2 January 2015 at 4:00 pm	and is filed under Solving Blogs. You can follow any responses to this entry through the RSS 2.0 feed. You can leave a response, or trackback from your own site.